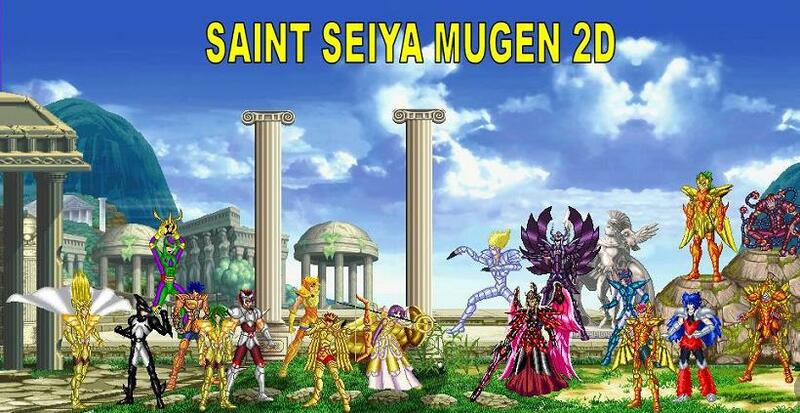 Your friend Orion is updating the entire mugen system of Saint seiya with the new mugen 1.1 codes and some patches. This section serves as the test of these characters. The most common codes are Remappal, Winquotes and TAG System. About the TAG System, the code version is from Shiyo Kakuge, so do not expect them to behave in the same way as the UNO TAG TEAM SYSTEM program path. - 48 chars LR with Tag system. - 8 chars JUS with Tag system and Winquotes. - 14 bonus with Tag system. * I can not apply the remappal because the chars are not properly pixelated. All chars are in 1.1 format for hight compression and best perfomancy of mugen memory. Some codes have been revised. The chars of the mugen pixart team when I update them will be routed directly to that team. When they put the file in their forum, an link redirecting the user will be created. Do not ask me for direct links to these chars, okay ?! You will need a screenpack with the TAG system. Currently the most stable is the version reprogramada by the friend Gui. The files Exe (3v3,4v4 and normal) hakeados for the extension of memory from 2GB to 4GB. This patch is not official, but to this day it has fixed my problems with stability in mugen. Gradually I am releasing the chars, as I see no out of place effect or serious error when converting to Tag mode. follows the Jus chars in the Tag system. The author shadow mercer released a game, with them updated, however these were converted by me from the old versions. two things made me do it. The first was that the chars that I had corrected as far as possible the 5000-5072 group. In the new chars, this was not obeyed. I also took out the cosmic estelars of MU and Aioria, because in 4v4 mode, strange black stars appeared. Hyoga's black backgrounds were also removed. The mu has undergone a change in a hyper to get closer to the current version. Sorry, I do not really have time to rebuild the 5000 - 5072 of 6 chars group again. As friend Shadow mercer did not create new palettes, it ended up weighing too much to leave the version I had with me. however, some blows can still see black effects. I will not waste time with this now, but it seems that 4v4 does not support exaggerations with explosive effects. This is even reasonable since part of the memory is focused on working with 8 chars in real time. Something amazing for mugen, a simple tool that was born Dos, if I'm not mistaken. The sff and snd is lighter as I usually do. This time we have the 3d chars in the Tag system. I published 7 chars. The Saga, Shina train, Kanon and all the athenas. . I noticed that there is an update of the TAG system based on the latest version of mugen released by Elecbyte. In this version the player will not have problems with Explod effects. Soon those black colors in explosions like fire among other things in 3v3 and 4v4 did not happen in this version. Anyway, the exe files are more stable. Remember the settings on your system, because depending on the platform I left a 4Gb patch of memory ready for systems that work in 64 bits. Download of the files in first message of Topic. I released the cassios and seiyaTrain of Tonos. In the Cassios and Seiya Train, I modified the Intro codes to a bug where Intro failed in versions 1.0 and 1.1. Besides this error, the bug where the cassios duplicated in an interactive intro with the seiya was solved. Has anyone noticed? I discovered this by the shoulder pads. I have modified the codes of the 3D version to assist the Oscar in an eventual update in the future if he prefers. for now i only make updates of deaht mask,and new shiryu dragon. the mode tag is very good but difficul for mi and need time for adapt this.i wait for a mode more easy for can use this.for now i use normal mode mugen.sorry for my english). when is out new chars of u.c? oscartsg1 wrote: for now i only make updates of deaht mask,and new shiryu dragon. At the end of December, they will publish algol. In 2018 the Hades be released as well. As for regular chars, this is still uncertain. por fin me e aclarado con lo del sistema tag.es mas fácil de lo que parece instalarlo.la única duda que me queda es donde consigo uno que pueda usar yo a los dos luchadores al canbiarlos(normalmente cuando cambias el segundo lo usa el ordenador,y prefiero usarlo yo).y otra gran duda;como esto es una gran novedad y la verdad pero que muy buena,los de u.c añadirán este sistema a la próxima expansión? I have covered char tauro and other chars to the tag system, but this for example when leaving help it does not do it well. With the program, it tells me what I'm doing with the red numbers so that they go green. I was aware of this program, but avast would not let me open the file, even if I wanted to. My update is manual. So I'm taking all this time. There are at least three system tags in mugen. I prefer Russian Tim Markworth. As for the chars they need to be reviewed one by one. That's why it's taking so long. Intro, wins, powers and the assistant combo (stadef 1000). The latter case does not have the char can speak or hang. Anyway, updating your normal mugen to Tag mode is not something that is done from day to night, unfortunately it takes a few months. - TEAM ARCADE, TEAM VERSUS, TEAM COOP, SURVIVAL AND SURVIVAL COOP. To call the char exchange just press right + left + a (strong punch) + y (medium kick.). The wizard is activated with the combination of keys a + y. Also you can make these combinations. > ctrl + 1 (before the 1st round starts) - The CPU will command the 1st character in Team Arcade. > ctrl + 2 (before 1st round starts) - p2 will command the 1st character in Team Arcade. time in Team Arcade mode. Although I have already mentioned this program, I will leave the file in the description to update the chars for the Tag. However, remember that each char has a unique programming. You will not be able to escape a general overhaul in it. Eu tinha consciência desse programa, porém o avast não me deixou abrir o arquivo, mesmo eu querendo. Minha atualização é manual. Por isso, estou levando esse tempo todo. Há pelo menos três sistemas tags no mugen. Eu prefiro o do russo Tim Markworth. Quanto aos chars eles precisam ser revisados um a um. Por isso, estou demorando tanto. Intro, wins, poderes e o combo do assistente (stadef 1000), todos este detalhes precisam ser revistos. O combo do assistente não tiver no char, pode falar ou travar. Enfim, atualizar seu mugen normal para o modo Tag não é uma coisa que se faça do dia para noite, infelizmente leva alguns meses. - TEAM ARCADE, TEAM VERSUS, TEAM COOP, SURVIVAL E SURVIVAL COOP. Para chamar o trocar de char basta apertar a tecla right + left+ a(soco forte)+ y(chute médio.). O assistente é ativado com a combinação das teclas a+y. Também você pode fazer essas combinações. >ctrl+1 (antes do inicio do 1° round) - A CPU comandará o 1° char no Team Arcade. >ctrl+2 (antes do inicio do 1° round) - O p2 comandará o 1° char no Team Arcade. tempo no modo Team Arcade. Embora já tenha falado desse programa, vou deixar na descrição o arquivo para atualizar os chars para o Tag. Porém, lembre que cada char possui uma programação singular. Você não vai poder escapar de uma revisão geral nele. friends, I released the two versions of Dio. With the remappal, they lose the sense of existence, but at this moment, I think best not try to unify anything. The spectrum version has a differential attack on the silver version. In the future, perhaps unify all versions spectrum of knights in a single char. The programming of Babel and Dante is the same. I improved the 2 intro of the babel that had I modified to the spectrum version. Two years ago I knew very little about programming. Another time, let's unite the two versions. However, per hour , I respect the divisions and those who by an option of taste want to acquire. A programação do Babel e Dante é a mesma. Melhorei a 2 intro do babel que tinha modificado para a versão espectro. Há dois anos, eu sabia muito pouco de programação. Outra hora, vamos unir as duas versões. Porém, por hora vou respeitar as divisões e aqueles que por uma opção de gosto querem adquirir. Oye, estoy un poco confundido. Acaso hay dos temas para lo mismo o son distintos? Se ve interesante, ya tengo rato que no he jugado con el mugen, me gustaría probar está nueva adaptación. Aragon wrote: Oye, estoy un poco confundido. Acaso hay dos temas para lo mismo o son distintos? Here I can update the chars of those authors or teams that allow or do not call for an improvement as long as I do not touch the credits. Like Tecla2000, mey_Z, Mikezamjara, master-shion, Pardo, Zahori and many others. 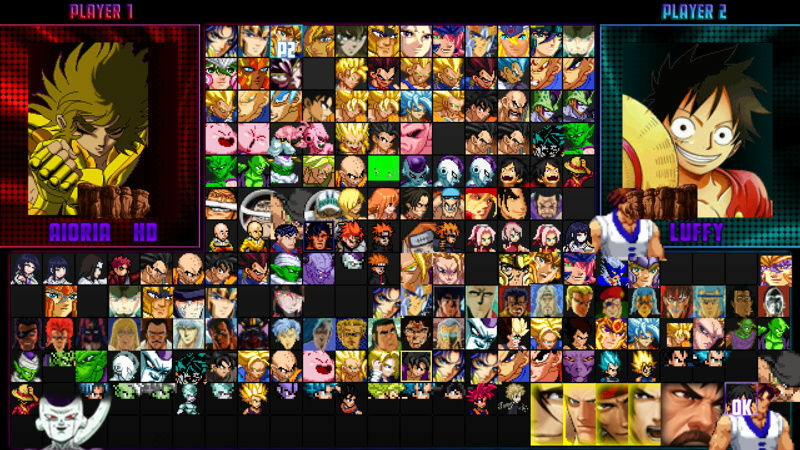 Already teams like Mugen Pixart, the links will never be here. We respect their policy. Of course, I will make their chars available on their forum, but I will only send the links when all the chars in my list are converted. Anyway, this topic will have some chars restriction. Unlike another where you, me and 9 other people work with news things in mugen. Aqui posso colocar a atualização dos chars daqueles autores ou equipes que permitem ou não ligam para uma melhoria desde que eu não mexa nos créditos. Como o Tecla2000, mey_Z, Mikezamjara, master-shion, Pardo, Zahori e muitos outros. Já equipes como a mugen Pixart, os links jamais estarão aqui. Respeitamos a política deles. Claro, eu disponibilizarei os chars deles lá no fórum deles, porém só mandarei os links quando todos os chars de minha lista estiverem convertidos. Enfim, este tópico terá restrição de alguns chars. Diferente de outro onde você, eu e outras 9 pessoas trabalham com novidades para o mugen. 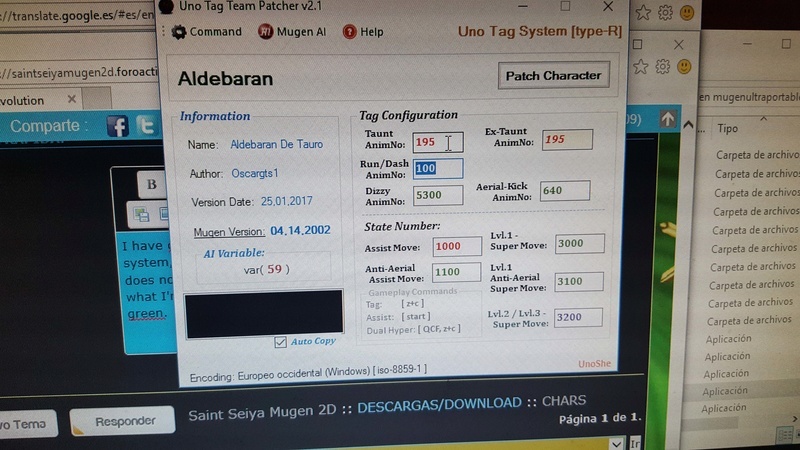 Master-Shion wrote: Se ve interesante, ya tengo rato que no he jugado con el mugen, me gustaría probar está nueva adaptación. It's an interesting novelty. But for the time being we'll keep this in a separate section. The mugen is migratingfrom PC to android as well. At the moment the only functional version is winmugem. So, for the time being it is interesting to leave active the old sff settings of the active chars. I believe that soon, the Brazilian who working with the emulator call exgear go will be able to reach version 1.1. The original idea for this system was developed from a game of Kof, where it was allowed the exchange of characters in the fight. For years some programmers have tried to leave this functional system, but only around 2015 began to have effective results. Popularization is only taking place now. Thankfully they did not give up on the idea. pufff..casi e pasado mi mugen a tag completamente.aun fallan algunos chars pero no pasa nada. una cosa muy chula y creo seria posible se hiciera en el sistema tag,es por ejemplo que tu compañero saliera cada x tiempo como reespaldo(sin tener que pulsar tu nada;seria de ayuda).a lo mejor a los 20 segundos sale y te ayuda a tu personaje durante digamos 20 o 30 segundos,y después se fuera.y lo mismo con el enemigo(salieran con tiempos no concretos).asi seria mucho mas emociónate pues no sabes lo que pasaría.y para que quedara de lujo que tuvieran la opción de salir entre una selección de 6 0 7 personajes aleatorios).asi no sabes quien saldría ni como ayuda ni como enemigo de refuerzo.esto a mi me encantaría lo hicieran. Todavia me falta...como vuelvo un screenpack a Tag System? que archivos se debe agregar? posdata. (a los que usen tag system).ya por YouTube hay muchos screemapck en descarga en sistema tag system,que en el modo arcade puedes usarlo. oscartsg1 wrote: ya por YouTube hay muchos screemapck en descarga en sistema tag system,que en el modo arcade puedes usarlo. ¿Hay alguna forma de convertir un screenpack de saint seiya a sistema tag system? Y con el Uno tag team system puedes manejar hasta 4 chars e ir pasando de uno a otro? I'm using the most up-to-date versions. Because of this, chars are in Japanese, Spanish, Italian, Latin, etc. I do not use a single language. However, if you really have some more updated chars, send it to me by MP. I'm running out of time, maybe I missed something. Eu estou usando as versões mais atualizadas. Por causa disso, os chars estão em japonês, espanhol, italiano, latino, etc. Eu não uso uma única língua. No entanto, se realmente você tem alguns chars mais atualizados, mande para mim por MP. Atualmente estou sem tempo, talvez tenha escapado algo. 2.Fix stadef 5030 - dizzy/continue? 1. Fix stadef 5030 - continue? 1. Fix stadef 5030 - dizzy/continue? some are feeling lack the chars of mugen pixart? I have news of them. I gave some samples to FobiaZ and the team said they will update their own chars. I taught the process to FobiaZ as much as I could. When they release the chars I put redirecting links. Anyone who is in a hurry, can do the process taught by his friend Orion. 1. Some srites have undergone a pixel review.